Groundhog Day 2016: Punxsutawney Phil Did Not See His Shadow : The Two-Way After a tap of a cane on Phil's tree-trunk cage, his door was opened, and the animal emerged to proclaim an early end to winter. 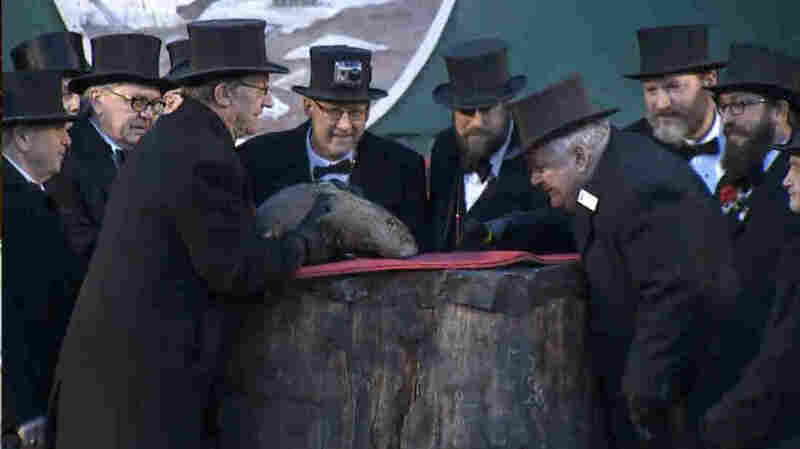 A screengrab of a video by the tourism website of the state of Pennsylvania shows the groundhog Punxsutawney Phil being watched for signs of his shadow. Interpreting Phil's behavior, the Groundhog Club emcee proclaimed, "There is no shadow to be cast! An early spring is my forecast!" He added, "Take your jackets off, you're not going to need them!" Of course, other groundhogs are available. There's always Staten Island Chuck in New York and General Beau Lee in Georgia — both of whom concur with Phil. That's enough to make up what some would call a repetition of groundhogs (which is evidently the collective noun for the animals, although that seems a bit too cute). If you just like the movie Groundhog Day and don't know what the fuss is about this animal on a random Tuesday, here's a video for you.